Are there logical divisions within the global whole of social interactions and systems that permit us to focus on a limited, bounded social reality? Is there a stable level of social aggregation that might provide an answer to the “units of analysis” question in the social sciences? This is a question that has recurred several times in prior postings — on regions (link), on levels of analysis (link), and on world systems (link). Here I’ll focus on the nation-state as one such system of demarcation. We can start with a very compelling recent critique of current definitions of the social sciences. Andreas Wimmer and Nina Glick Schiller offer an intriguing analysis of social science conceptual schemes in “Methodological nationalism and beyond: nation-state building, migration and the social sciences” (link). (Wimmer’s Nationalist Exclusion and Ethnic Conflict: Shadows of Modernity is also of great interest.) The core idea is the notion that the social sciences have tended to conceptualize social phenomena around the boundaries of the nation-state. And, these authors contend, this assumption creates a set of blinders for the social sciences that makes it difficult to capture some crucially important forms of social interaction and structure. Their view is a complex one. They think that the social sciences have been trapped behind a kind of conceptual blindness, according to which the concepts of nation and state structure our perception of social reality but disappear as objects of critical inquiry. Second, they argue that there were real processes of nation and state building that created this blindness — from nineteenth century nation building to twentieth century colonialism. And third, they suggest that the framework of MN itself contributed to the concrete shaping of the history of nation and state building. So it is a three-way relationship between knowledge and the social world. “Nationalism” has several different connotations. First, it implies that peoples fall into “nations,” and that “nations” are somewhat inevitable and compact social realities. France is a nation. But closer examination reveals that France is a social-historical construct, not a uniform or natural social whole. (Here is a discussion of Emmanuel Todd’s version of this argument; link). Alsatians, Bretons, and Basques are part of the French nation; and yet they are communities with distinct identities, histories, and affinities. So forging France as a nation was a political effort, and it is an unfinished project. Second, nationalism refers to movements based on mobilization of political identities. Hindu nationalists have sought power in India through the BJP on the basis of a constructed, mobilized (and in various ways fictional) Hindu identity. 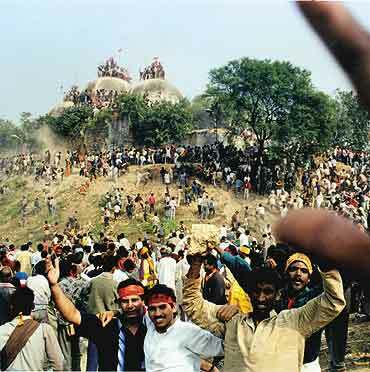 The struggle over the Babri Mosque, and the political use to which this symbol was put in BJP mobilization, illustrates this point. But “nationalist politics” also possess a social reality; it is all too evident that even fictive “national identities” can be powerful sources of political motivation. So nationalist politics in the twentieth century were a key part of many historical processes. (Michael Mann’s The Dark Side of Democracy: Explaining Ethnic Cleansing illustrates this point.) And, of course, there may be multiple national identities within a given region; so the “nation” consists of multiple “nationalist” groups. Ben Anderson’s Imagined Communities: Reflections on the Origin and Spread of Nationalism provides an extensive development of the political and constructed nature of ethnic and national identities. What about the other pole of the “nation-state” conjunction — the state? Here the idea is that the state is the seat of sovereign authority; the origin and enforcement of legal institutions; and the holder of a monopoly of coercive power in a region. A state does not inevitably correspond to a nation; so when we hyphenate the conjunction we make a further substantive assumption — that nations grow into states, and that states cultivate national identities. Wimmer and Schiller seem to point in a direction that we find in Saskia Sassen’s work as well: the idea that it is necessary for the social sciences to invent a new vocabulary that does a better job of capturing the idea of the interconnectedness of social activity and social systems (for example, in A Sociology of Globalization; link) . The old metaphors of “levels” of social life organized on an ascending spatial basis doesn’t seem to work well today when we try to deal with topics like global cities, diasporic communities, or transnational protest movements. And each of these critiques makes a convincing case that these non-national phenomena are influential all the way down into the “national” orders singled out by traditional classification schemes. My field (International Relations) is stuck in this "black box" that is the nation-state. But its changing. I'll be starting postgrad school soon and will be working on the governance of labor mobility in this region. I'm taking the 'global governance' approach – newish in my field. With this framework there is no privileging of the 'nation-state' and actors above and below are also objects of study. Anyway, thanks for the links! I'm probably not qualified to comment, but your post reminded me of the following which you have probably seen: http://www.foreignaffairs.com/articles/63217/jerry-z-muller/us-and-themIt seems related since in some cases ethnicity seems to trump nation-state.